Though many of us think about giving back to our communities year-round, it can’t be denied that the winter holidays are a strong reminder to harness our gratitude into action to help those in need. We love how folks in the cider community frequently — and creatively — finds ways to support causes close to their hearts, hosting benefits, fundraisers, food drives and more. But we want to give some special props to Blake’s Hard Cider, the Michigan-based company known for its portfolio of refreshing, crisp modern ciders made from apples grown on its orchard. In April 2018, Blake’s launched an entire cause-driven series, Kinder Cider, with Rainbow Seeker, a pineapple and sage cider made in partnership with the Human Rights Campaign. On November 1, 2018, the second Kinder Cider was released: Fido, made in support of the nonprofit Pets for Patriots, an organization in 41 states that works to place shelter animals with veterans. Fido (the name refers to both the Latin word for loyalty and the all-purpose nickname for pups) is a 6.8% ABV hopped raspberry and grapefruit cider. The Blake’s team has set a goal to raise $10,000 and beyond for Pets for Patriots, during FIDO’s season, which will last until February 1, 2019. 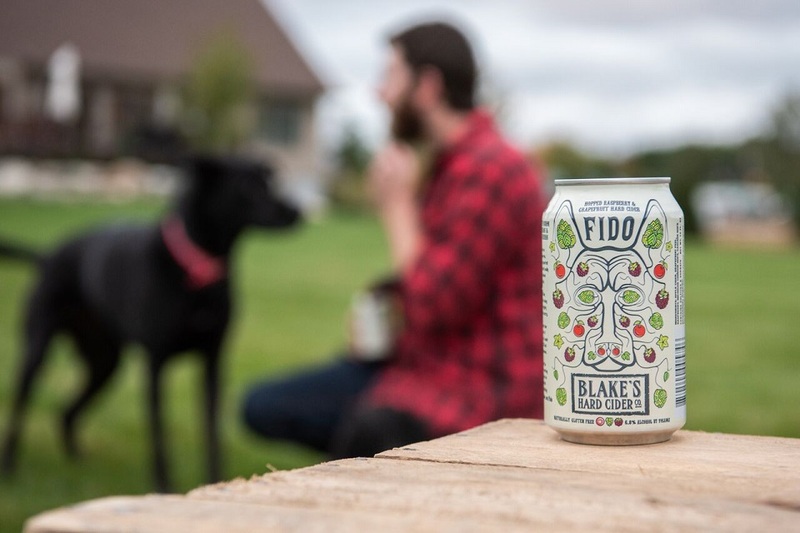 Fido is available at Blake’s tasting room and in the 18 states where its ciders are distributed. Looking for another way to support the cause? Blake’s also created a limited-edition set of Fido swag that’s really well-designed — including dog accessories like A DOGGIE BOW TIE. Enough said! Blake’s Hard Cider is located at 17985 Armada Center Rd. in Armada, Michigan; phone (586) 784-9463.